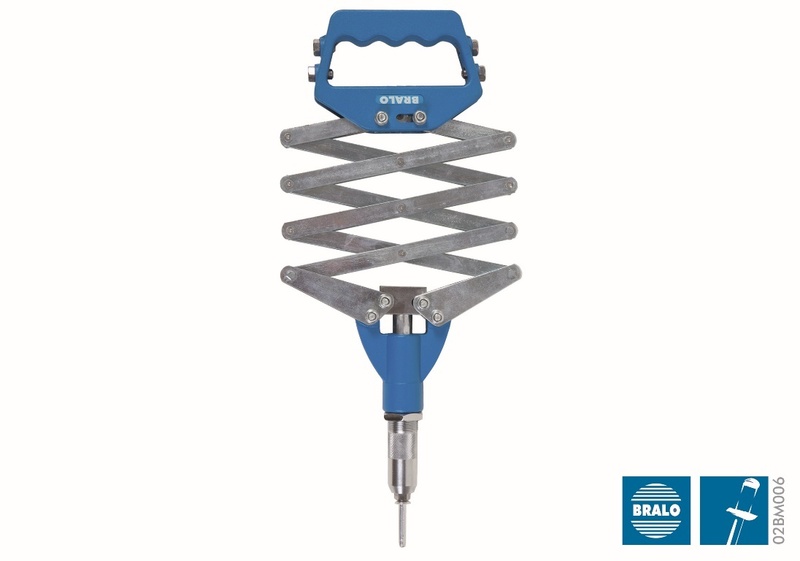 The Bralo BM-67 is an expandable riveting tool capable of placing rivets up to 6,4 mm. It is designed for a professional use in places where there is a difficult access to the riveting area. Main body and handlers manufactured in a high density aluminium casting. For use both in and outdoors. Very useful to fix elements in reduced spaces. Riveting capacity up to 6.4 mm. The connecting bars that constitute the bellows are manufactured in straps of steel, providing the tool with a great resistance. It has a very long head / nose piece holder, which facilitates work in applications with a difficult access. Provided with a cavity for the additional nose pieces. Solid, safe and easy to use tool. The Bralo BM-67 riveting tool is available packed in a protective box.